Peanut butter and jelly – we go way, way back. I wouldn’t be shocked if I was told that peanut butter was my first word (er, words). As a toddler I had a peanut butter and jelly sleeping bag that I finally gave up fitting into somewhere around middle school. As a kid, I chose a peanut butter and jelly sandwich over any other lunch option provided to me. One year in grade school I gave up peanut butter for Lent and thought that the world might just stop spinning by the time Easter rolled around (I made it, although vividly remember eating a toasted English muffin with peanut butter and jelly for breakfast on Easter morning that year). I would put peanut butter on just about anything – Eggo waffles and Brown Sugar & Cinnamon Pop-Tarts were my favorite victims as a kid. 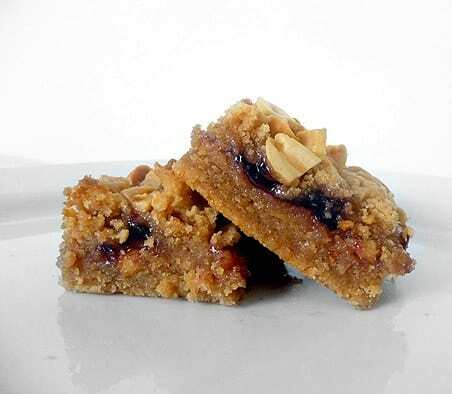 As you can see, I have a serious love affair with peanut butter, so imagine my shock when I realized I had survived almost 30 years (ouch) without peanut butter and jelly cookie bars. 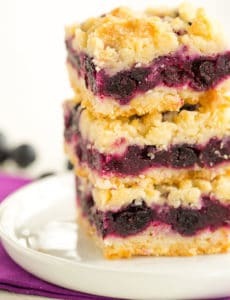 These bars taste just like biting into a peanut butter and jelly sandwich, minus the bread of course. 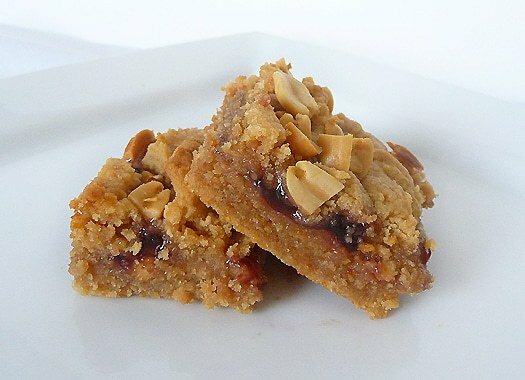 A base of peanut butter cookie dough is topped with your favorite jam or jelly, dotted with more peanut butter dough and sprinkled with chopped peanuts. They are every bit ooey, gooey and delicious as you’d expect. Obviously a great treat for kids (and one that would be fun to make with them, too!) and peanut butter-loving adults as well. You pretty much can’t go wrong here. Enjoy! 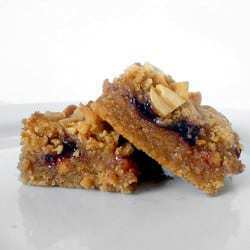 These bars are so tasty - you have to try them! 1. Heat oven to 350 degrees F. Grease a 9x13-inch pan with butter, and line the bottom with parchment paper. Grease the parchment, and coat inside of pan with flour; set aside. 2. Whisk together the flour, baking powder and salt; set aside. 3. Place the butter and sugar in the bowl of an electric mixer fitted with the paddle attachment. Beat on medium-high speed until fluffy, about 2 minutes. On medium speed, add peanut butter and eggs; beat until combined, about 2 minutes. Add the vanilla and combine. On low speed, add the flour mixture and mix until just combined. 4. Transfer two-thirds of the mixture to prepared pan; press evenly into pan. Using an offset spatula, spread the jam on top of the peanut butter mixture. Dollop remaining third of peanut butter mixture on top of jam. Sprinkle with peanuts. 5. Bake until golden, about 45 minutes. Transfer to a wire rack to cool; cut into about 36 1½x2-inch pieces. These are fantastic! I made them to snack on during the football game last Sunday. Grown-ups and children alike loved them. This recipe makes a lot, so I brought the rest to the office Monday morning. They were gone within an hour. I still to this day put peanut butter on my waffles and brown sugar Pop-Tarts! I’m your newest fan! This is the third recipe i have made from your site and they are all fantastic! Yum! I have this baking in the oven right now! I can’t wait to try it!! I’m an obsessed Christmas cookie baker. 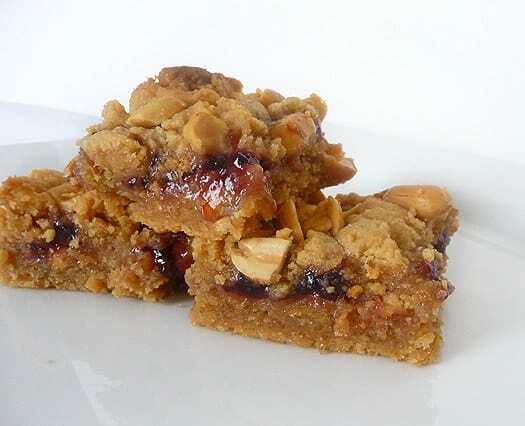 This is the first year for the PB&J bars and they will be on my cookie list from now on! Someone described them as PB&J fudge! Hi there! 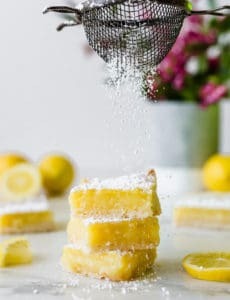 My friend’s mom passed this recipe on to me a few years ago and I make them often, they are fantastic. I just decided to try something new though. i made the same peanut butter dough base but then I also made a cheesecake filling. Then, after the first layer of peanut butter dough, I spread a layer of nutella, then the cheesecake layer on top and then the gobs of remaining dough. Just took out of oven and waiting to cool to taste, but wondering what you think of this combination? Hi Naomi, It sounds delicious! Believe it or not, I don’t really like Nutella so I pretty much never bake with it, but I know I’m in the minority ;-) I do love the combo of peanut butter and cheesecake! 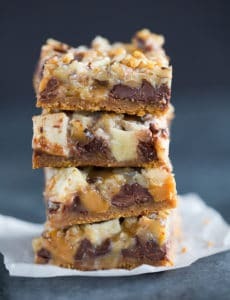 I made these bars this weekend–the recipe cannot be beat! They are perfect!